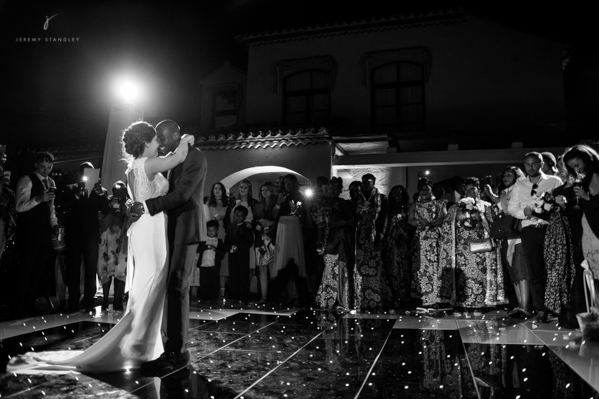 In Part One we met childhood sweethearts, Kelsey and Everton football star Yannick Bolasie who celebrated their huge family affair in the quaint town of Casares. Today we find out if everything went to plan. Was it really the wedding in Spain of their dreams? The day itself was a magical affair. Kelsey opted for an Art Deco inspired gown while the bridesmaids wore floor length dresses with navy capped sleeves. Hairdresser Maite created an elegant plaited bridal up do, which was complemented by the soft smoky eye and glowing skin by make-up artist Nicola. The ceremony was a lively affair. Yannick and his mother were greeted by air horns (left over from the FA Cup final in which Yannick had played seven days earlier with his former team, Crystal Palace). Everyone was on their feet, celebrating in style by the time Kelsey arrived in a vintage car. Afterwards the guests were transferred to a local venta at the edge of the valley, where they were able to sample local tapas and cava. At the reception a multitude of glass vases were filled with delicate white blooms and a scattering of vintage style crystals. Fairy lights were strung above the dining tables and chandeliers hung majestically from the trees. Up-lighters were positioned to highlight the sides of the mountain – the whole effect simply exuded classic elegance. The speeches started half way through the wedding breakfast and Yannick’s went down a storm – it was very clear that here was a man deeply in love. After dessert it wasn’t long before DJ Edu got the LED dance floor rocking and soon the Veuve Cliquot was flowing. Let’s just say this family knows how to party! The party booth was also great success, with even Yannick himself donning an elf outfit. For those who needed a little time out a Moroccan chill out zone was provided, where guests were able to enjoy shisha pipes. Award winning photographer, Jeremy Standley, captured every special moment during the day, much to the delight of the family when the received their photos.